Home » Our Doctors » Christopher Bullin, O.D. 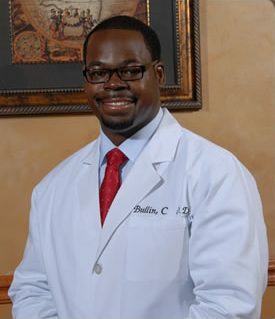 Dr. Christopher Bullin, O.D., MBA, of Mississippi EyeCare Associates, is an experienced Optometrist who has practiced in the Jackson-Metro area since June of 2007. He is a native of Grenada, MS. He received his Doctorate of Optometry from South College of Optometry in 2007. His undergraduate degree from MS College in 2002. He earned his Masters of Business Administration from Belhaven University in 2012. He is currently President of the MS Chapter of the NOA (National Optometric Association), current member of the AOA (American Optometric Association) and MOA (MS Optometric Association). Dr. Bullin educates his patients on preventive measures by providing detailed consultations and utilizing state of the art equipment. Performing detailed annual eye exams are vital for longevity in maintaining healthy eyes. At Mississippi EyeCare Associates, we care about our patient and our goal is to provide our patients with the best care possible each time you visit our clinic.